Device for hunting underwater; transfers a powerful electrical charge to the prey. Really the grandfather of the taser. In this excerpt, Captain Nemo is explaining to his reluctant guest Monsieur Arronax, how it is possible to use a rifle underwater. "Besides M. Aronnax, you must see yourself that, during our submarine hunt, we can spend but little air and but few balls." The Leyden jar is a cylindrical container made of a dielectric (an insulator, like glass) with a layer of metal foil on the inside and outside. With the outside surface grounded, a charge is applied to the inside surface. This gives the outside an equal but opposite charge. When the outside and inside surfaces are connected by a conductor, the stored electrical energy is discharged. It was the world's first working capacitor. 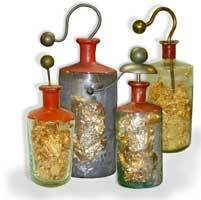 The Leyden jar was first discovered by Ewald Georg von Kleist, a German inventor. However, Pieter van Musschenbroek of the University of Leyden discovered the Leyden jar independently in 1746 and the name remains. Find out more about the Leyden Jar at Faradnet. The Leyden jar was used in the first atom smasher, built at Cambridge University. This device used banks of them as condensers and could store up to one million volts. And, for those of you who long to join Captain Nemo and hunt in the ocean depths, conveniently located just outside your baroque 19th century submarine, you can get close with the Aquarius Underwater Laborator Virtual Tour (requires Ipix plug-in). Or, read more about the Captain Nemo's submarine - the Nautilus.